The tragic downing of a Malaysian passenger plane MH17 sent Putin’s elaborate propaganda machine into overdrive, ultimately causing it to unravel. The evidence points overwhelmingly at the terrorists, whose leaders are Russian citizens, current and former members of the Russian armed forces and FSB. The Malaysian airliner was shot down at approximately 17:30 (Moscow time). The wave of coverage commenced with the posting on the social media page of a Russian terrorist Girkin (also known under his pseudonym “Strelkov”) at 17:50. Russia’s mainstream media routinely uses postings on this page as the primary source for their news stories. In his commentary, Girkin boasted that the terrorists managed to shoot down another Ukrainian plane, specifically mentioning what he believed at the time to be a Ukrainian AN-26 airplane, shot down in the area of Torez. Girkin postured, writing: “We warned you – don’t fly in our skies” and followed up his comment with two videos, depicting the aftermath of the crash. A similar message was posted by one of Girkin’s cohorts, Pavel Gubarev (also known as the Neo-Nazi Santa Claus). After their closer inspection revealed that the terrorists had, in fact, shot down a civilian airliner, Girkin attempted to debunk his own earlier assertion with a bogus message allegedly broadcast by Ukraine’s President, Petro Poroshenko. In a garbled pidgin-Ukrainian (obviously written by someone who doesn’t speak the language), with numerous misspellings, President Poroshenko allegedly admitted that Ukrainian military shot down “the terrorist plane.” This desperate attempt at subterfuge would fail to impress even the most gullible readers. 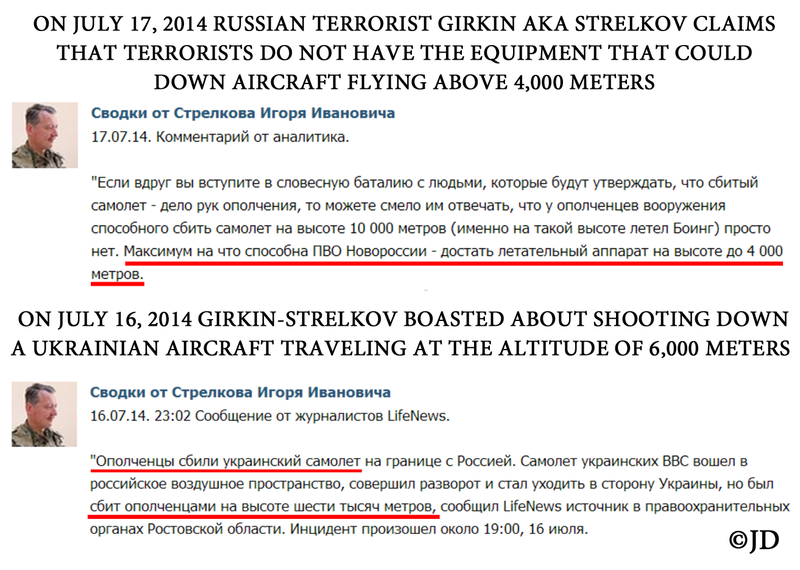 In another failed attempt to hide his culpability, on July 17, 2014, Girkin claimed that the terrorists did not have any equipment capable of shooting down the aircraft traveling at the altitude of more than 4,000 meters. Only one day earlier, on July 16, 2014, Girkin boasted of the terrorists shooting down a plane that was traveling at an altitude of 6,000 meters. These obvious contradictions are self-explanatory. Tragic events of July 17, 2014, demonstrated that a group of drunken rag-tag bandits, headed by Russian intelligence officers and members of the military, should not be entrusted with weapons of any caliber, much less anti-aircraft missile systems. 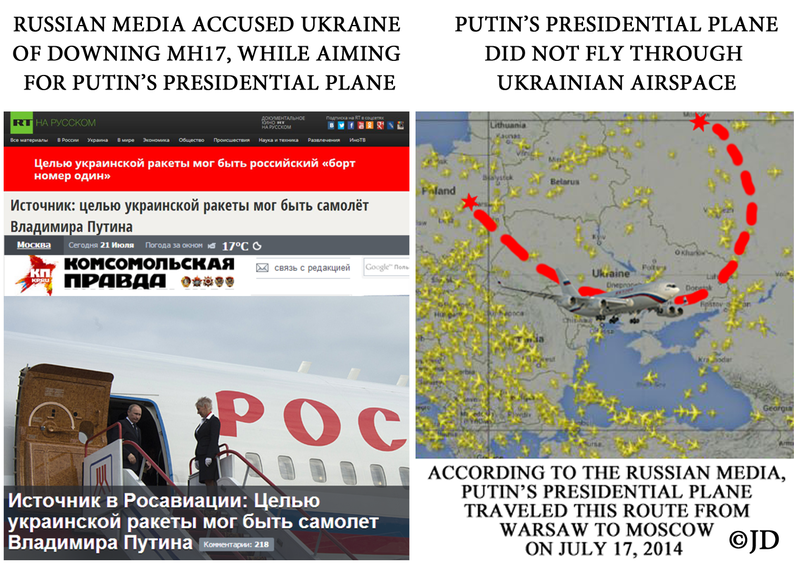 One of the most bizarre exertions, blaming the Ukrainian military for allegedly shooting down the Malaysian airliner, was based on a claim that this was an attempt to murder Russian President, Vladimir Putin. Networks reported that on July 17, 2014, the presidential plane took quite a bizarre round-about route across Ukraine, on its way from Warsaw, Poland to Moscow, Russia. It was reported by Russia Today (more than once), Komsomolskaya Pravda and a number of other Russian mainstream media outlets. Russian aviation sources assert that Putin’s airplane never flies through Ukrainian airspace (particularly since the time Russia started fomenting unrest in the East of Ukraine this year). It should be noted that since the beginning of this crisis, Ukrainian Air Force has not fired a single missile, despite several alleged violations of their airspace by Russian aircraft. Since Russian terrorists in Eastern Ukraine do not operate any type of aircraft in the area, there is no plausible explanation for the outrageous speculation that Ukrainian military would suddenly attack an airplane. Furthermore, a professional radar operator would have been able to distinguish between a civilian airliner and military aircraft. Russian mainstream media proudly boasted that the terrorists had in their possession SA-11 missile systems, also known as the Buk-M1 surface-to-air missile system. 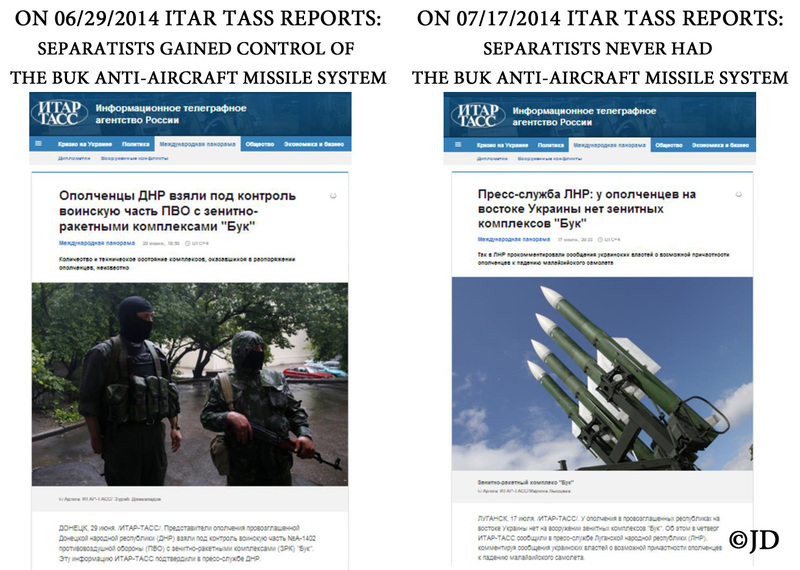 For example, on June 29, 2014,ITAR-TASS news agency reported that “rebels” gained control of a Buk missile installation. 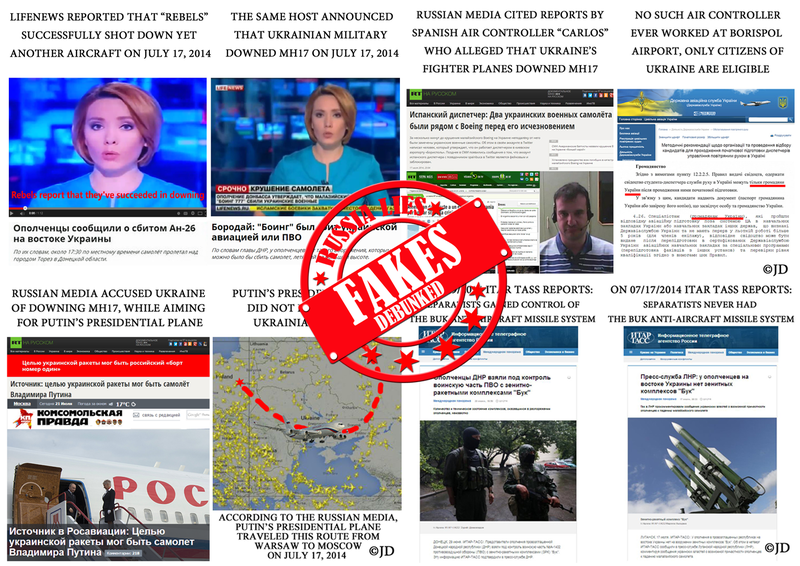 After the system was apparently used to shoot down the Malaysian airliner on July 17, 2014, ITAR-TASS reported that none of the “rebels” in any of the self-proclaimed “republics” in Eastern Ukraine ever had the lethal and sophisticated Buk. Recent intelligence reports reveal that neither one of these stories were correct, since the weaponry used for the attack, along with the crew of operators, was imported from Russia and later returned. 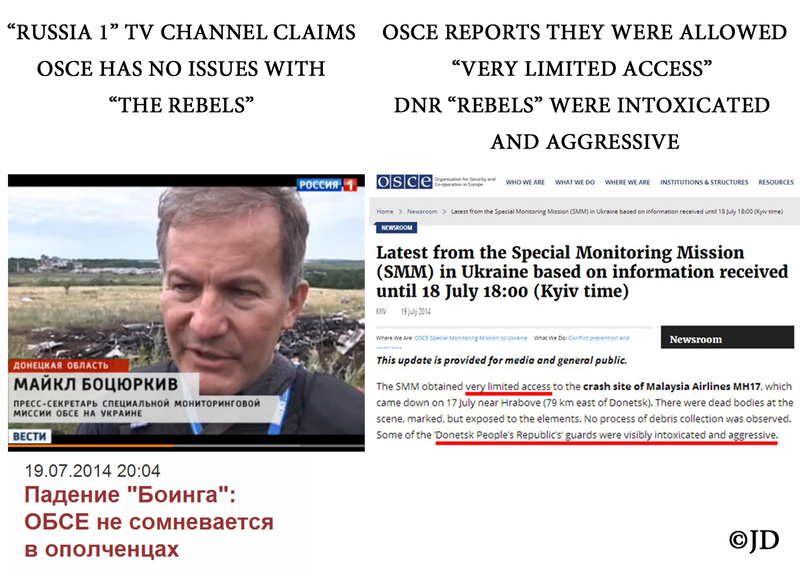 “Russia One” television channel and other mainstream media in Russia would have you believe that OSCE has full trust in the “rebels” and has been granted full access to conduct a thorough investigation. In reality, OSCE report complains of “visibly intoxicated and aggressive” terrorists, who have given the investigators very limited access. Journalists on the scene report that victims wallets have been completely emptied, their belongings were looted and corpses ignored, while the terrorists took shameless selfies on-site. 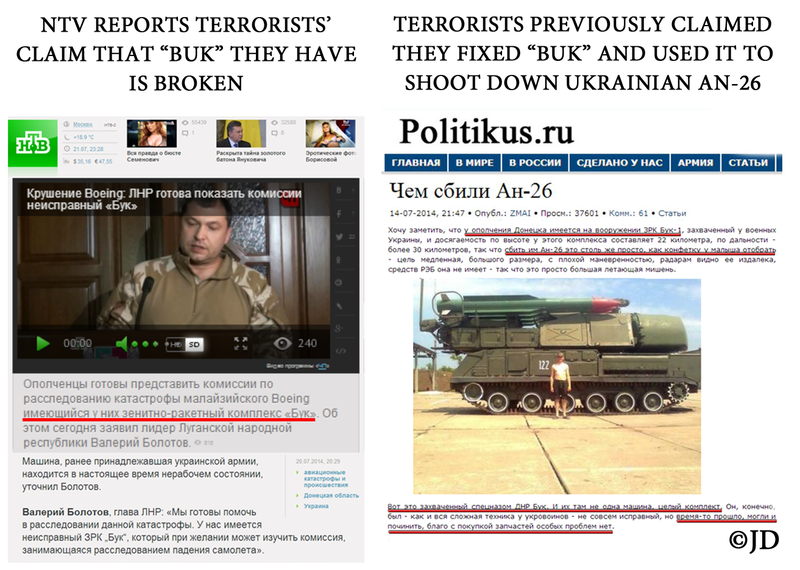 The same terrorists who first proudly boasted they had the Buk system, then categorically denied it after shooting down MH17, now say they do have Buk, but it is “broken.” It should be noted that the terrorists previously claimed that should Buk malfunction, they could easily fix it up and use it to shoot down planes “like taking candy from a baby.” Russian news media gushed about the so-called “rebels” who will “guard the skies” with their new Buk system. Russian Twitter trolls, working in tandem with propagandists and the media, spread “happy news” about repaired Buk being ready for use as of July 14, 2014. Russian mainstream media often relies on unnamed social media users and self-proclaimed experts, without fact-checking any of their claims. Russia Today found someone claiming to be “Carlos,” an alleged Spaniard, working as an air traffic controller in Kyiv’s international airport, Borispol. Without ever fully identifying himself, “Carlos” Tweeted in Spanish that Ukrainian jets were following the passenger plane and shot it down. Numerous prominent news outlets picked up this ridiculous story, including television channel Russia 24, the Defense Ministry’s Zvezda channel, Rossiiskaya Gazeta and Komsomolskaya Pravda. No one found it suspicious that a foreigner would be working in a Ukrainian airport and live-Tweeting ridiculous claims, while not speaking either Russian, Ukrainian or English languages (Russia Today had to interview him in Spanish). Minimal fact-checking would have revealed that Ukrainian authorities do not hire non-citizens of Ukraine as airport dispatchers, or even accept them for training as such. As usual, Russia Today was unperturbed by these minor details. On July 17, 2014 Russia Today acknowledged that the unidentified “Carlos” ran a fake Twitter account, which had been deleted. 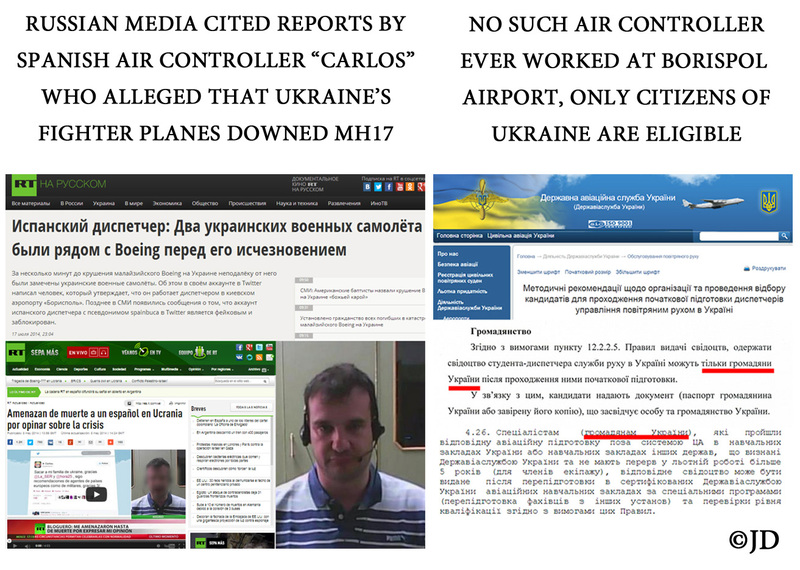 Two days later, on July 19, 2014, Russia Today again cited “Carlos” as their primary source in another article. Notorious Girkin birthed one of the most outlandish allegations, claiming that all of the passengers on the Malaysia flight were already dead, prior to the plane being shot down. To buttress this allegation, Russian media raised the question of why the passports of the victims appeared to be so clean, as though they were brand new. This red herring may indeed impress some people in Russia, where the passport has to be shown even when you’re simply taking out the trash. This approach is drastically different from the West, where the passport is used mainly for international travel. 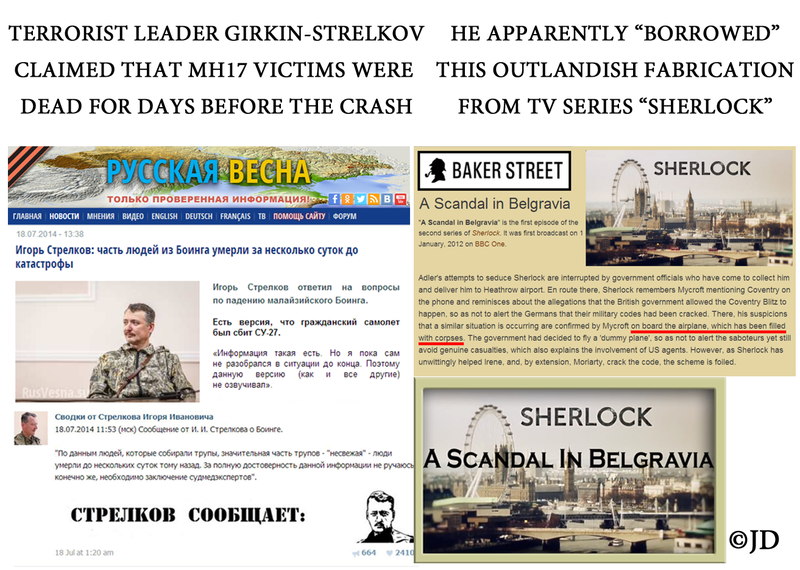 Girkin likely borrowed this twisted tail of “corpses on a plane” from a British TV Series, “Sherlock.” Girkin’s lame attempt of convincing the world that his group of merry terrorists didn’t murder hundreds of innocents, “because they were already dead,” only magnifies their obvious culpability. The SU-25 is a ground attack aircraft, designed to defeat small mobile and stationary ground targets and to engage low-speed air targets at the forward edge. The Boeing 777 is certainly not a low-speed or low altitude air target. If the Ukrainian military (for some unknown reason) actually meant to target an airliner, it would likely use the SU-27, which is a long-range air superiority fighter. Furthermore, technical specifications of the SU-25 list its service ceiling as 7,000 meters (22,965 feet) unarmed or 5,000 meters (16,000 feet) when armed to the max. The Boeing 777 was flying at the altitude of 33,000 feet. 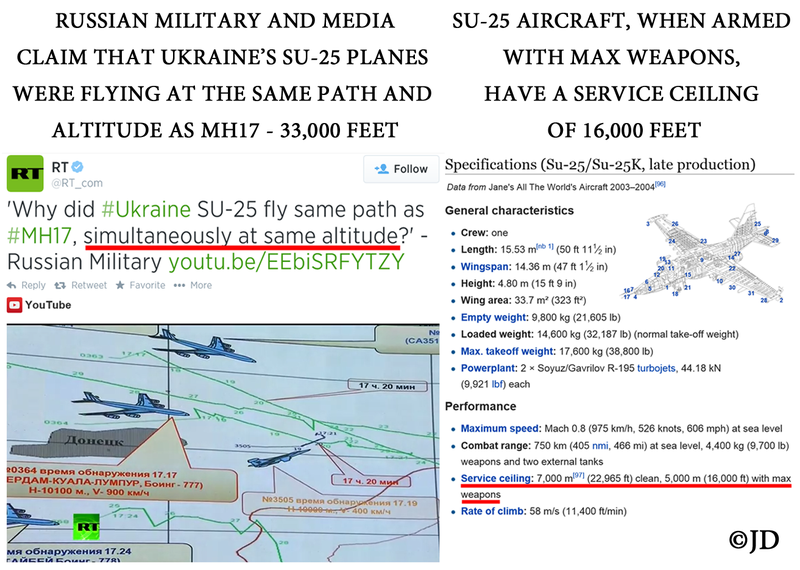 Russian military officials explained this glaring disparity by stating that the SU-25 can fly as high as 10 km (32,808 feet) “if it wants to.” Someone should notify the manufacturers that they’re selling themselves short, according to SU-25’s magic powers to overcome its own technical limitations. 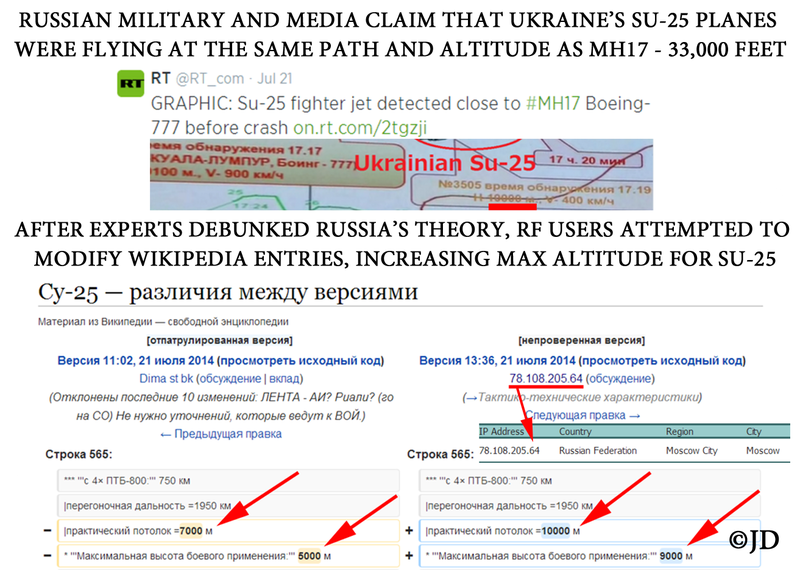 Just in case someone was to doubt the magic plane that could fly higher “if it wants to,” Russian Wikipedia was edited to achieve the desired effect. The user who attempted to edit the page (IP 78.108.205.64 ) was located in Moscow, Russia. 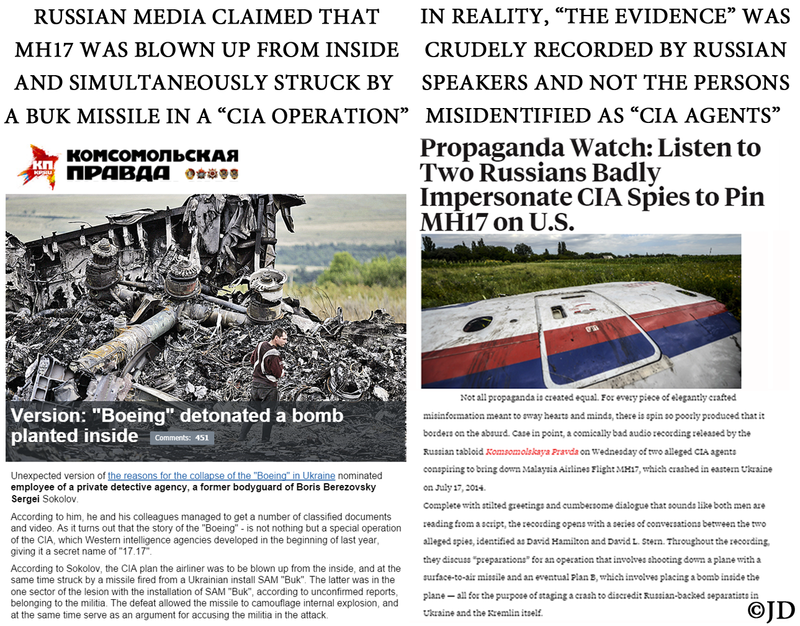 Russia’s mainstream media disseminated an outrageous tale, claiming that the downing of Malaysia’s Boeing (flight MH17) over Eastern Ukraine was “a special operation of the CIA.” This ridiculous claim was brought forth by Sergei Sokolov – the former bodyguard of Boris Berezovsky, the Russian oligarch who was found dead at his palatial Berkshire home in 2013. According to Sokolov, the CIA plan was to blow up the airliner from within, while simultaneously striking it with a missile from a Ukrainian “Buk”. The man identified as Mr. Stern speaks with British accent, while the real Mr. Stern speaks American-accented English. Both men in the recordings don’t talk like native English speakers and use awkward dialogue and uncommon expressions. Bellingcat, the New York Times and Foreign Policy have reached the only plausible conclusion, declaring that the recordings were obviously fake. In the days following the downing of MH17, the Russian media went into overdrive, manufacturing numerous outlandish theories. 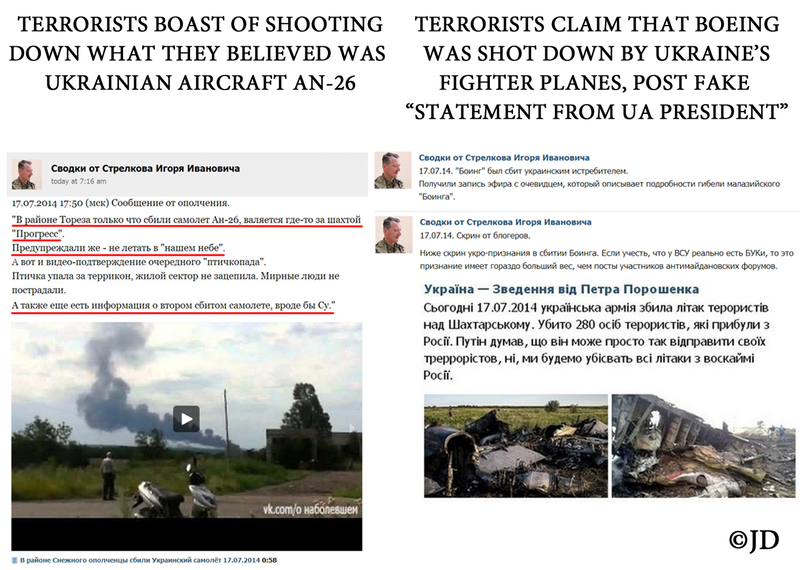 One of such tales involved an unnamed character, who gave an interview to notorious Russian propaganda outlet, Komsomolskaya Pravda, claiming that MH17 was shot down by Ukrainian pilot, 30-year old “Captain Voloshin.” His story is not even remotely believable, since this alleged “witness” falsely claimed that Ukrainian planes, SU-25, were continually bombing Lugansk and Donetsk “on a regular basis.” In fact, the Ukrainian military never used their aircraft to bomb any of the terrorist-controlled territories. Ukrainian planes and helicopters were used only for transporting cargo and personnel. For added benefit, this “witness” alleged that the Ukrainian military regularly uses thermobaric weapons and cluster bombs. 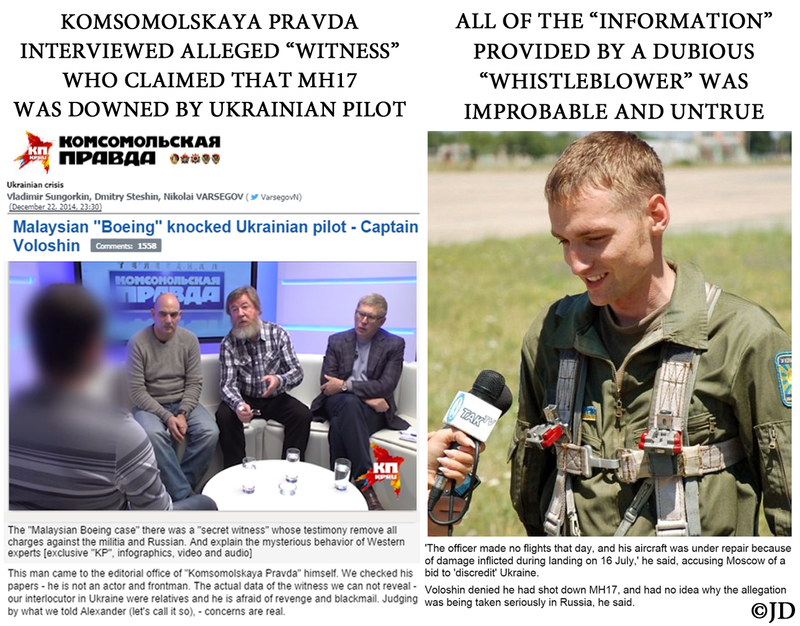 The fake “whistleblower” alleged that two Ukrainian planes were shot down by Russian fighter jets and Captain Voloshin fired back, accidentally hitting the Malaysian Boeing instead. Vladislav Voloshin and his commanders vigorously denied every aspect of this crudely manufactured stunt of Russian propaganda. The Ukrainian military did not engage in any aerial combat throughout this conflict, quite simply because Russian terrorists in Ukraine have no airforce of any kind. This makes any allegations of the Ukrainian military targeting nonexistent planes of enemy combatants especially absurd. Russian warplanes are not known to ever engage in aerial combat with the Ukrainian airforce. Multiple Ukrainian airliners were shot down by terrorists from land, utilizing surface-to-air missile systems. This claim is completely false. The final report of MH17 investigation is replete with references to Almaz-Antey and the information they’ve provided, thoroughly analyzing and considering manufacturers’ data. 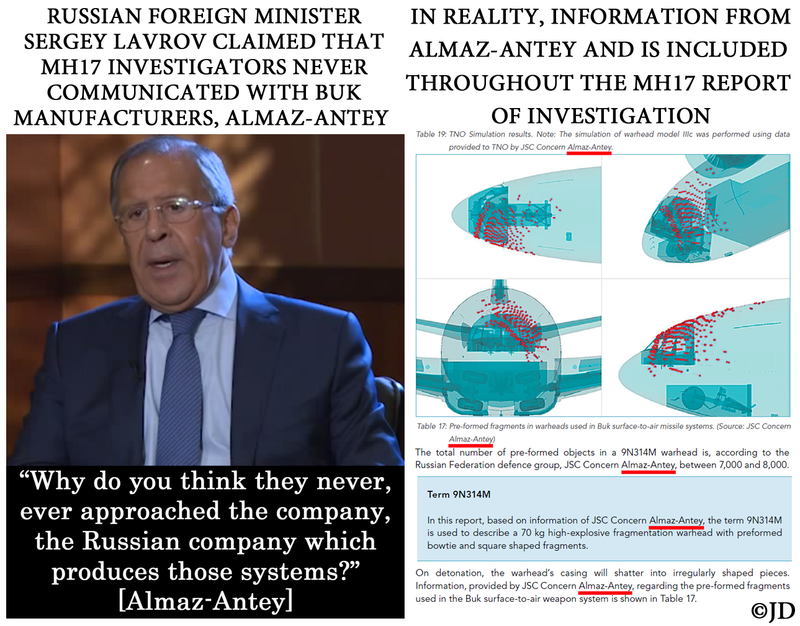 Contrary to claims in the Russian media, the information offered by Almaz-Antey was neither “ignored” nor disregarded.